Have a wonderful Easter weekend with your family celebrating the promise of our risen Lord! Our little country church has a sunrise service outside where we can also watch the sun come up. Parishioners are cuddled in blankets and sleepy children are awed as the pastor speaks, his breath rising in the air. On a hill near the pastor is a stone tomb where a play is enacted of Jesus rising from the dead as our Lord promised. We then gather inside where the men have made a breakfast of bacon, eggs, sausage gravy, and biscuits to serve to this early congregation. 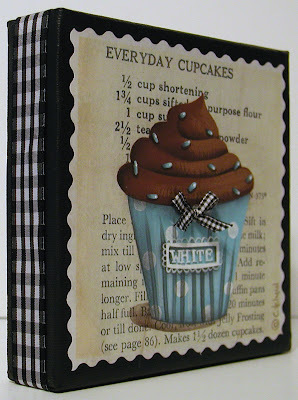 A moist white cupcake with milk chocolate frosting is painted on top of a recipe from an old cookbook that is decoupaged to a canvas. Tiny blue confetti is sprinkled on top of the fluffy frosting. 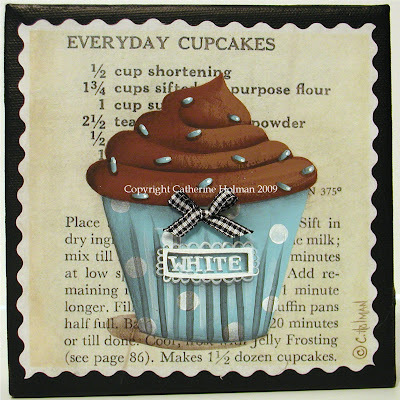 A blue dotted cupcake liner and a "white" tag embellish this yummy cupcake. A tiny black and white checked ribbon is hot glued above the label. A black and white checked ribbon is attached to the edge of the canvas. The entire picture is painted except for the recipe and the ribbon. Hello my friend! I've been away from visting my blog buds because work has been really really crazy, so by the time I get home I'm pooped! Got caught up again with all of your beautiful work, I especially love the 3 cupcakes in red...adorable!!!! Thanks for visiting my blog and commenting on my spring project. Curious what you think I should plant in the corner there. It's too cold yet, so he just left it ready and mulched. Would love to hear your opinion! Your church service sounds wonderful! As soon as the Mrs's gets up, it looks like chocolate and coffee for breakfast again. Hi Catherine, happy Easter to you. Love your cupcake recipe painting...it is wonderful. Chippies Shanty is a working crab house. Kind of cool, and also offers crabs at a better price than the markets down town. On another note, my wife and I splurged Easter morning and enjoyed some nice Chocolate and coffee with our favorite. "Smith Island" Cake, the state of Maryland desert. Yuuum and calories. "Oh well!" Catherine, I just love your work. You amaze me with your God given talent. Hi Cathie, me again! Im giving you an award! my name is Janine and Íam visiting your blog for the first time. Sweet Kaili gave both of us the Renee Award. So I heard about you. I am impressed by your paintings. I feel like gaining weight, from just looking at your cake-pictures. So swet. But the landscape- pictures simply overwhelm me. I won´t be here for the last time. I wish we had that recipe. I think it is like the Coca-Cola recipe, locked up somewhere. The Sweet Shop in Crisfield, MD., has the ability to ship their famous Smith Island Cakes, and "Boy are they good!" You have got to give it a try.